That Bring to life what 'simple marketing' does with inbound marketing, blogs, content marketing, digital marketing and more. Described here are examples of marketing, inbound marketing strategy, content marketing and social media marketing that bring to life the spirit of 'simple marketing.' These are Simple Marketing Now examples as well as ones from projects that Christine Whittemore led during her tenure with Solutia Inc. They capture 'simple marketing,' practical marketing solutions and the integration of traditional with social media marketing. You may also enjoy reading our blog article titled 100+ Case Studies: Social Media Marketing Examples organized by category. We followed that up with 200+ Case Studies: Social Media and Content Marketing Examples. If you don't see examples relevant to your industry or business, let us know as we are constantly gathering references. Also check out Client Interviews on the Simple Marketing Blog. Website Redesign: Complete Redesign for KronotexUSA.com! These blog articles examine blogs from the Social Flooring Index listing, exploring what they do well, and what steps they might take to become more effective. 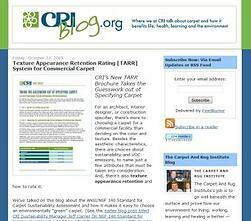 The Carpet and Rug Institute Blog [CRI Blog] was launched in April 2009 to cost effectively increase the visibility of the Carpet and Rug Institute's research based resources and counter the myths surrounding carpet. In six months, the blog generated a positive ROI and created several opportunities to counter misinformation and promote success stories. For more details, read The Carpet and Rug Institute Blog: 6 Month Case Study. As Business Director for the Wear-Dated Upholstery Fabric division,Christine Whittemore managed a multi-location sales and marketing team of 8 with overall responsibility for the long term growth of the $50M residential Wear-Dated upholstery business. As a result of her team's strong focus on the marketplace, and successfully transforming the brand, the business doubled in size in 4 years. Repositioned Wear-Dated upholstery fabric brand and business from performance-only product limited to one end use to a fashion and performance product for wider range of residential upholstered furniture. Conducted research with consumers, retailers and fabric mills to identify business opportunities, program weaknesses, validate new positioning and updated brand. Doubled market share in competitive environment. Launched www.weardated.com and www.setsalesonline.com for sales people in upholstery business, leading to 130% increase in retail salesperson incentive program participation. Expanded program to Canada and Mexico; explored expansion to UK, Scandinavia and Brazil. Led yearly offsite strategic summit for 200+ residential upholstery leaders. Strengthened relationships, increased brand value and addressed critical issues: women consumers and improving the retail experience. Introduced revolutionary new fiber product (Ginny®) to expand Wear-Dated brand product selection. Received Solutia’s Customer Focus Award for 2000 for growth in Wear-Dated upholstery program. For more details, read Wear-Dated Upholstery Transformation: Case Study. 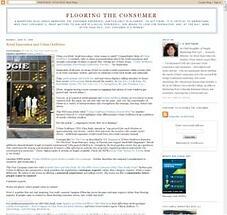 Flooring The Consumer, a blog about marketing-to-women and the retail experience, was launched on June 27, 2006 as Whittemore's personal business blog. 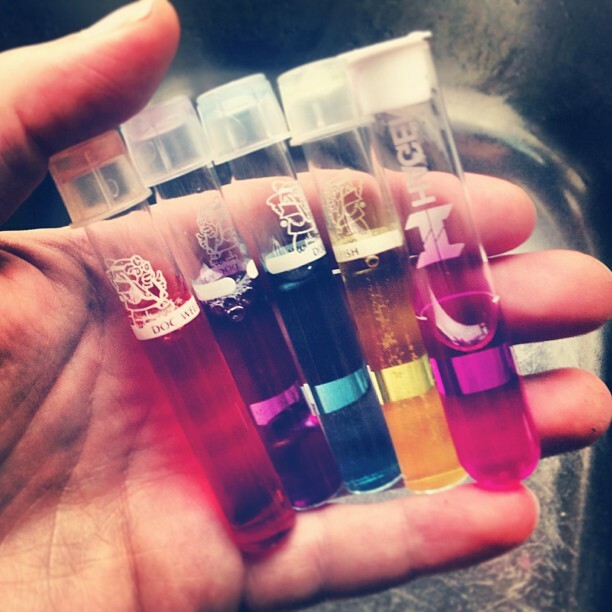 It represented an opportunity to explore and experiment with new and social media marketing. It also created an archive for the research Whittemore conducted and a valuable followup resource for conversations and presentations about the retail experience and marketing to women. The blog improved Whittemore's and Wear-Dated’s brand visibility within the industry and outside it, generating goodwill, strengthening the value of presentations and articles written, while spending no additional funds. The blog is listed in the AdAge Power 150. For more details, read Flooring The Consumer: Case Study. About all things carpet related, the Carpetology Blog celebrated fashionable carpet, how to care for carpet, how to purchase carpet, how to deal with carpet issues as well as quirky, unusual and inspiring 'carpet in the news' stories. 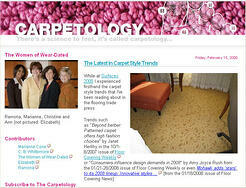 The Carpetology Blog was launched in December 2007 in anticipation of the launch of the redesigned Wear-Dated website in June 2008. In 15 months, we generated 181 blogposts ranging from stories specifically promoting Wear-Dated to ones offering valuable tips, advice and recommendations, interspersed with color trends, carpet in the news and carpet style information. The blog attracted close to 40k visits and almost 60k page views, driving better qualified visitors to the Wear-Dated website and a great deal more awareness of all of the benefits - including style, comfort and quality - that carpet offers. For more details, read The Carpetology Blog: Case Study. Christine created the first ever in-depth product analysis program for use as consultative up-selling tool with retailer accounts to preferentially sell branded Wear-Dated carpet fiber products. Originally, a multi-month manual process, the final automated program generated best-in-class customized retailer reports, taking otherwise irrelevant and unrelated data and converting it into actionable information, all available in minutes to individual users. For more details,read Wear-Dated Report Builder: Case Study as well as Meet Blue Lacuna's Eric Glaser. Christine B. Whittemore developed consultative training presentations for Wear-Dated Representatives to use to enhance brand value with retail accounts in the marketplace. These led to stronger relationships with retailers and retail salespeople and to the development of targeted programs to drive volume increases. Start a conversation with Simple Marketing Now. Or, Contact Us. You can even subscribe to the Simple Marketing Now eMail Newsletter for periodic updates.